"Jesus saw a man called Matthew sitting at the tax office, and he said to him: Follow me." Jesus saw Matthew, not merely in the usual sense, but more significantly with his merciful understanding of men." He saw the tax collector and, because he saw him through the eyes of mercy and chose him, he said to him: "Follow me." This following meant imitating the pattern of his life - not just walking after him. Saint John tells us: "Whoever says he abides in Christ ought to walk in the same way in which he walked." "And he rose and followed him." There is no reason for surprise that the tax collector abandoned earthly wealth as soon as the Lord commanded him. Nor should one be amazed that neglecting his wealth, he joined a band of men whose leader had, on Matthew's assessment, no riches at all. Our Lord summoned Matthew by speaking to him in words. By an invisible, interior impulse flooding his mind with the light of grace, he instructed him to walk in his footsteps. In this way Matthew could understand that Christ, who was summoning him away from earthly possessions, had incorruptible treasures of heaven in his gift. 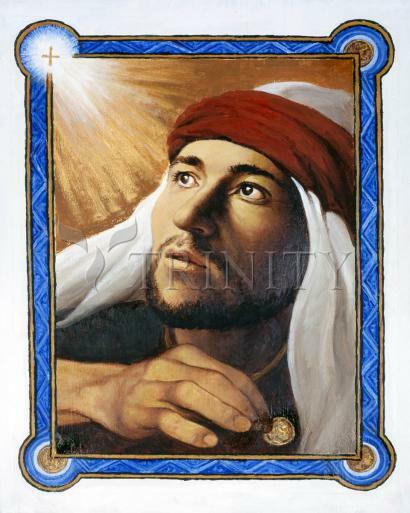 Matthew was a Jew who worked for the occupying Roman forces, collecting taxes from other Jews. The Romans were not scrupulous about what the "tax farmers" got for themselves. Hence the latter, known as "publicans," were generally hated as traitors by their fellow Jews. The Pharisees lumped them with "sinners" (see Matthew 9:11-13). So it was shocking to them to hear Jesus call such a man to be one of his intimate followers. Matthew got Jesus in further trouble by having a sort of going-away party at his house. The Gospel tells us that "many" tax collectors and "those known as sinners" came to the dinner. The Pharisees were still more badly shocked. What business did the supposedly great teacher have associating with such immoral people? Jesus' answer was, "Those who are well do not need a physician, but the sick do. Go and learn the meaning of the words, 'I desire mercy, not sacrifice.' I did not come to call the righteous but sinners" (Matthew 9:12b-13). Jesus is not setting aside ritual and worship; he is saying that loving others is even more important. We imagine Matthew, after the terrible events surrounding the death of Jesus, going to the mountain to which the risen Lord had summoned them. “When they saw him, they worshiped, but they doubted. Then Jesus approached and said to them [we think of him looking at each one in turn, Matthew listening and excited with the rest], ‘All power in heaven and on earth has been given to me. Go, therefore, and make disciples of all nations, baptizing them in the name of the Father, and of the Son, and of the holy Spirit, teaching them to observe all that I have commanded you. And behold, I am with you always, until the end of the age’ ” (Matthew 28:17–20). Matthew would never forget that day. He proclaimed the Good News by his life and by his word. Our faith rests upon his witness and that of his fellow apostles.